It was a record breaking day in all sorts of ways at Croke Park on Sunday last as Kerry Minor footballers were crowned All Ireland champions and winners of the Tom Markham Cup for the 15th time in all when overwhelming Derry om a score of 6-17 to 1-8. Superbly led by team captain David Clifford, Kerry took control of this game inside the opening ten seconds when Clifford opened up the Derry defence for the first of his four goals and from there on in there was going to be only one winner. While there were some outstanding performances, not least that by Electric Ireland Man of the Match David Clifford, this was essentially a superb team performance and while the players were the ones who delivered on the pitch, Peter Keane and his management team can take a huge amount of credit for the way they had the team prepared for the job in hand. Kerry have now made history by becoming the only team to win four titles on the trot and one would need a lot of space to itemise all the record breaking achievements from last Sunday’s game. 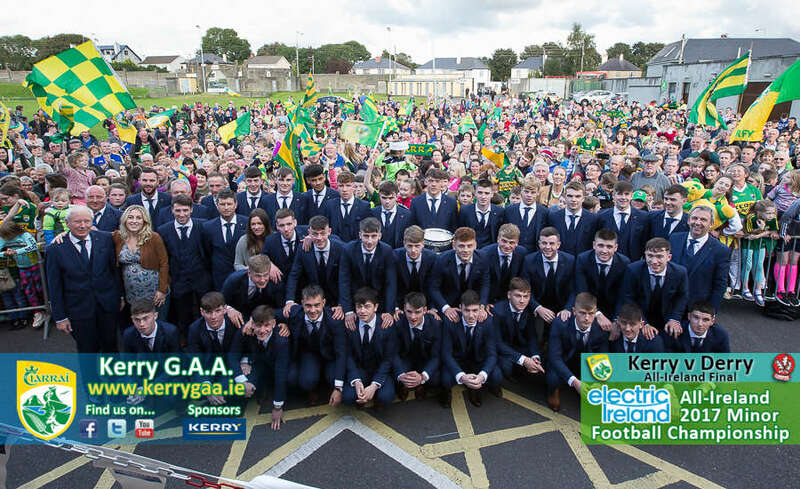 The team and their parents were treated to a post-match banquet hosted by Kerry Group on Sunday night and on Monday evening the team was welcomed home in Fitzgerald Stadium Killarney and afterwards in Fossa GAA Club. So, Kerry have gone from the point of not being able to win a minor title in twenty years to a stage where they are winning titles for fun and that certainly bodes well for the future of Kerry football. Congratulations to the players and management on a job well done.